"For the rigorous, but very rich, work of contemplating the face of Christ along with Mary, is there a better way than the praying of the Rosary?" "How much peace would flow into family relationships if the family would begin again to pray the Rosary!" Hail Mary, full of grace, the Lord is with thee; blessed are thou among women, and blessed is the fruit of thy womb, Jesus. Holy Mary, Mother of God, pray for us sinners now and at the hour of our death. Amen. O My Jesus, forgive us our sins, save us from the fires of hell, lead all souls to Heaven, especially those most in need of Thy mercy. Hail! Holy Queen, Mother of Mercy, our life, our sweetness and our hope. To you do we cry, poor banished children of Eve. To you do we send up our sighs, mourning and weeping in this valley of tears. Turn then, O most gracious advocate, your eyes of mercy towards us; and after this our exile, show unto us the blessed fruit of your womb, Jesus. O clement! O loving! O sweet Virgin Mary! Pray for us, O Holy Mother of God, that we may be made worthy of the promises of Christ. The Rosary of the Virgin Mary, which gradually took form in the second millennium under the guidance of the Spirit of God, is a prayer loved by countless Saints and encouraged by the Magisterium. Simple yet profound, it still remains, at the dawn of this third millennium, a prayer of great significance, destined to bring forth a harvest of holiness. It blends easily into the spiritual journey of the Christian life, which, after two thousand years, has lost none of the freshness of its beginnings and feels drawn by the Spirit of God to “set out into the deep” (duc in altum!) in order once more to proclaim, and even cry out, before the world that Jesus Christ is Lord and Saviour, “the way, and the truth and the life” (Jn 14:6), “the goal of human history and the point on which the desires of history and civilization turn”. 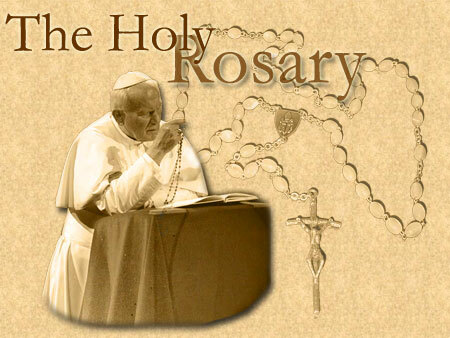 The Rosary is a Catholic devotion derived from the Latin word rosarium, meaning a “garland of roses,” originally referring to a spiritual bouquet of prayer given to Mary, the Blessed Mother of Jesus Christ. Specific prayers are repeated on the rosary beads while both vocal prayer and meditative contemplation are combined. In addition to the Apostles Creed and Hail Holy Queen, the repeated prayers are the Our Father, Hail Mary, Fatima Prayer, and Glory Be (see below). 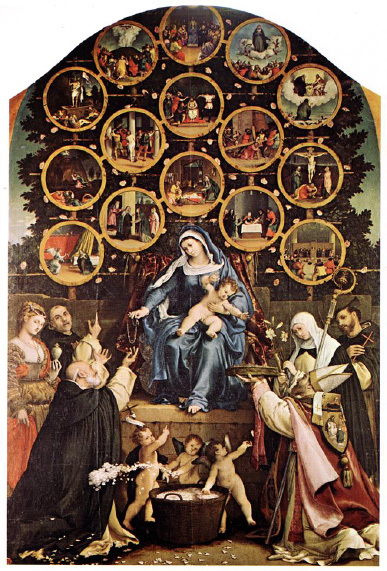 During each group of ten beads, or a “decade”, one of twenty Mysteries of the rosary is the subject of meditation (see below). Each mystery is an event from the life of Jesus Christ or His mother, Mary, and all but two are found in the Bible, or Sacred Scripture. 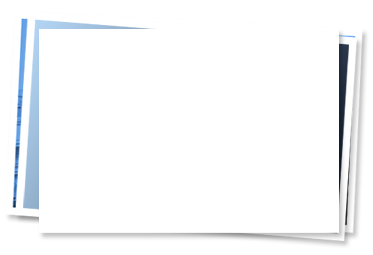 The four groups of mysteries are the Joyful, Luminious, Sorrowful, and Glorious Mysteries.